Mary Ingalls: Look what you did! You oughta be ashamed of yourselves talking to her that way! And she's gonna have a baby! You're awful! God will punish you! You'll see! You deserve it, all of it. God will punish you! I know he will! Q: What does Trudy Coulter buy at "Olson's Mercantile" that Mary Ingalls and Laura Ingalls are willing to help carry? Q: Is "Hansen's Mill" a real or fictional mill? 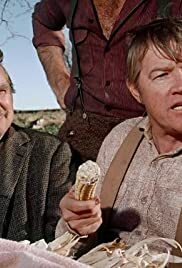 Q: What did Henry Holbrook show to a group of six guys that included Charles Ingalls and Lars Hanson while the group of six guys were sitting around a picinic table outside of Charles Ingalls, Caroline Ingalls, Mary Ingalls, Laura Ingalls and Carrie Ingalls' house? The character actors make it better! First of all, I must point out that at the beginning of this episode Charles talks like he's been there for several years when in fact, this is the first season for the Ingalls' family, so this should be their first crop. This episode is really about a man named Joseph Coulter, who thought that he had an answer for the farmers. Instead of growing wheat, they would start growing a special kind of corn. Strangely, after this episode, the idea seems to fizzle out. Charles jumps on the band wagon, but the other men are a bit hesitant. With a bit of prodding, they all agree. While Mr. Coulter makes the trip to get the corn, the men ready their fields in extreme excitement. They basically drive Charles crazy. Unfortunately, on his way back to Walnut Grove, Joseph meets disaster and has an accident. The men grow restless and the more they fester, the more unbecoming they become. Soon, they are blaming Joseph and Charles, who went looking for Joseph when he didn't show up. They even hassle Joseph's wife, Trudy, who is very pregnant with their first child. Though they all did a wonderful job in this episode, I especially admire Melissa Sue Anderson (Mary) and the way she spoke her mind to those men. Mrs. Olsen was also surprisingly sweet in this episode. She stayed on the side of the Ingalls-Coulter family and chased the men off with a broom. I always get so amused at how Nels stays quiet while she voices her thoughts! It's also important to take notice of a couple faces in this episode I recognized. Ted Gehring (who played Ed Stacy) will come back in a couple seasons as Laura's friend the banker, Mr. Sprague. Julie Cobb (Trudy Coulter in this episode) would play Jill Pembroke in the first season of Charles in Charge.